Join men's basketball head coach John Groce as he throws out the first pitch at Illini Night at Busch Stadium. All fans purchasing a ticket to this special Illini Night will receive an Illinois themed Cardinals cap! Orange and blue and Cardinal red – it’s a color combo that Illinois fans are familiar with at Busch Stadium. On Friday, Aug. 23, the St. Louis Cardinals will hold “Illini Day at Busch Stadium” when the Redbirds host the Atlanta Braves at 7:15 p.m. This year’s Illini Day, which is sponsored by the Division of Intercollegiate Athletics and the University of Illinois Alumni Association in partnership with the Metro St. Louis Illini Club will feature Illinois men’s basketball head coach John Groce throwing out the first pitch. In addition, fans that purchase an Illini Theme Night ticket will receive a one of kind orange and blue Cardinals hat designed specifically for Illini fans attending the game*. Tickets can be purchased online for as low as $30. 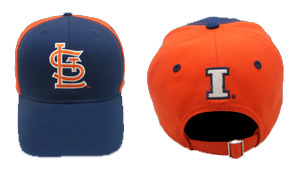 *Please Note: The Illinois themed Cardinals cap is available only with the purchase of a special Theme Night ticket. All Theme Night purchases for events that include giveaway items will come with a game ticket and a separate voucher. Fans may pick up their Illini Cap at the Ford Plaza Theme Tickets Kiosk, located between Gates 5&6, behind the Bleachers, from 5:45 to 7:45 p.m. on the night of the game. You will not be able to receive the item without your voucher with you at the event. More information can be found at http://cardinals.com/theme or at www.stlouisillini.org.